In April 2011, Par Farmer began running form the North Pole to the South. Scott Wegener spoke to him about his 10-month journey. You’re ‘courageous’ if you battle through a seemingly hopeless situation, or perhaps ‘crazy’ if you created the situation on purpose. However, if you put yourself in such hopeless circumstances in an effort to help those in an even worse predicament, you’re Pat Farmer. In what must be one of the greatest demonstrations of what the human mind and body is capable of, Pat Farmer has run from the North Pole to South Pole to raise funds for the International Red Cross’ clean water projects around the world. The 21,000km route was covered in just over 10 months at an average of over 65km a day. Some days Pat ran up to two and a half marathons in a day, which is more than 100km or 5 of Sydney’s City to Surf fun runs. Perhaps what astounded me most is the struggle he had to get sponsorship. To put it simply, almost no one thought he’d make the distance – so almost no one wanted to sponsor him. Pat sold his house and car to get the start up funds so he could begin the run and just hoped that enough sponsors would eventually get on board to covers the huge mounting costs. Pat attributes the survival of several near death misses on the trip to smart planning, being prepared and also a little divine help. “I’m a big believer that someone is watching over me,” he says. This isn’t Pat’s first long distance run. He’s been an ultramarathon runner (someone who runs in races that are further than a traditional marathon) for many years. Some of his runs include running across the US, around Australia and from the Northern tip to the Southern tip of Australia. In doing so he’s not only set world records but raised millions of dollars for good causes – not bad for someone who was “not good at school sports”. If you’ll excuse the pun, poles apart from Pats epic physical feats was his stint of nearly a decade sitting in Australia’s Federal Parliament. This was a time Pat found somewhat frustrating. “ I wanted to actually make a difference , not simply sit in meetings talking about changing lives,” he says. Even so, Pat still had some highlights from his parliamentarian days. 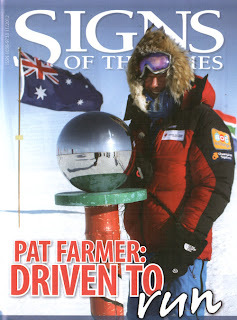 A few months after Pats Pole to Pole run he was awarded the 2012 Australian Geographic Society's Adventurer of the Year. Pat has also won Australian Achiever of the Year back in 2000. Despite Pat’s amazing achievements, which grants him unchallengeable bragging rights, he is rather humble about his achievements. Pat prefers to draw attention to the cause he ran for and encourage others to believe in themselves and what they can achieve if they put their mind to it. Pat admits he’s not the world’s greatest runner, but says the strongest part of his ability to run nonstop, literally from one end of the earth to the other, is the strength of his mind. It is his strong mind that gives Pat the willpower and the ability or overcome pain, and even boredom from so many hours out running by himself. It’s also believing in himself and what he’s capable of that helps him to achieve monumental tasks. In the times Pat hurt most on his run, he would think about the next time he could see “the lights of his life”, his two children, Brooke and Dillon. Pat has had to raise them without his beloved wife, Lisa, who died unexpectedly at 34 from heart disease. Brooke and Dillon’s names were even written on Pat’s ski’s to help motivate him through the horrendous conditions of the Artic. These days raising money and awareness for a cause usually involves shaving your head or growing a moustache, but Pat wanted really draw attention to a cause he’d recently grown so passionate about – clean water. Pats passion for the Red Cross’ clean water projects came after witnessing the real poverty in India, Nepal, Egypt and Peru in 2008 and in the following year while spending the school holidays with his kids helping an orphanage in Thailand. Pat points out how every 15 seconds a child passes away from a disease caused by lack of safe drinking water, inadequate sanitation or poor hygiene – things we take for granted in Australia and New Zealand. Pat dreamt of inspiring just 50 million of the world’s total population to donate as little as $2 each - reaching $100million. Astoundingly, by the end of his epic run Pat had ‘only’ raised a mere 0.1% of what he hoped to - $100,000. Falling so short of the dreamt financial goal, was the perilous run worth the energy? According to Pat, without doubt. Since returning home, more donations have come in and wells have already started to be installed and make a difference in people’s lives. I’d like to appeal for a donation from you, for a cause that lead one man to run to the height of the earth, to help some of the 880million fellow human beings who live without the most of basic item we take for granted – clean water. Please visit PoleToPoleRun.com to make a donation before you drink your next glass of water.